When it comes to smartphone connectivity, new car buyers will be getting a lot of love next year. Most major manufacturers have signed on to offer Android-powered and iOS-powered in-car displays as options, replacing the wonky, ugly systems that manufacturers have been designing themselves. That’s fine for new car buyers, but what about those of us with older yet-still-reliable vehicles? Well, a San Francisco startup called Navdy has a smart, future-forward option: an aftermarket heads-up display that projects information from your smartphone directly onto your car’s windshield. 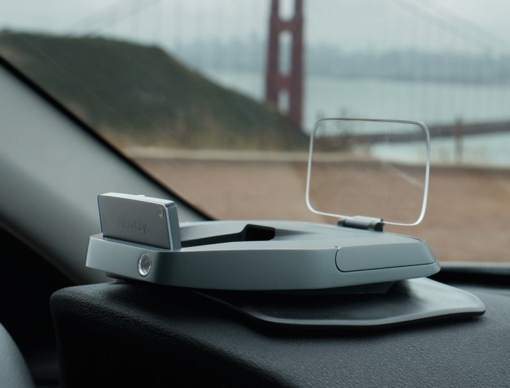 The Navdy device is designed to sit on your dashboard and connects directly to your car’s OBD-II port, standard on vehicles made in 1996 or later. It then connects wirelessly to your Android device or iPhone via Bluetooth, displaying incoming texts, call notifications and other information such that you never need to take your eyes off the road. You can interact with the device through voice and gesture commands (such as swipe to dismiss) for added safety. The device can even provide car service warnings and display your current speed, just like a built-in HUD would. The Navdy device is slated to retail for $499 when it hits store shelves in early 2015. If you pre-order now, however, you can snag the HUD for $299 – a pretty nice discount. For more details, check out the Navdy website or the short video below.